CAPRICORN LOVE From June 4, Jupiter takes up residence in your horoscope house of love and everything there expands. CAPRICORNS tend to suffer physically when under mental or emotional pressure or stress. 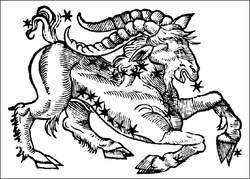 MONDAY'S CHILD will be Capricorn, if born before 11. In typical Capricorn fashion he was able to transform all his negative traits into something positive by creating his outrageous alter ego. Capricorns love quality, but they are often terribly wary of touching a nest egg. Between the year's two Solar eclipses, on April 19 and October 13, expect major romantic and career developments, with many Capricorns making major relation-ship commit-ments. Some Capricorns will found a new business, establishing a new role that fits like a glove. The Earth signs, Taurus, Virgo and Capricorn, are generally considered "down to earth" in fact they possess great creative and imaginative abilities while being practical and cautious. Which again, scotches the rumours that all Capricorns are tight-fisted and materialistic. All Capricorns want for Christmas: Males something well-made that will last a lifetime; females Christian Dior perfume, or pearls. SOPHIE was born on the cusp of Capricorn and Aquarius and, like all Capricorns, has a strong moral code - reckless and foolhardy she is not. For Aries, Madden designed an edgy, stacked platform shoe, while putting Capricorn feet in classic loafers.